Were testing bait which is something a little bit different the usual road testing of rods, reels, and lures. The team at Spikebait Australia were very keen for FishingMad to road test Spikebaits range of maggots ( black soldier flies ). There aim is to get this product out to the recreational anglers across Australia. Of course at FishingMad were always keen to try new products hitting our market. 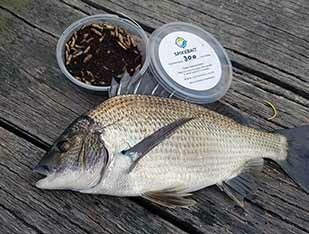 Spikebait is an Australian supplier of spikes or maggots with a difference. The maggots distributed to anglers are a byproduct of a facility that is reducing landfill through soldier-fly consumption of organic waste. Once the maggots are done with landfill, they process them into commercial fish-food. With the excess left over with is great for recreational fishing. These maggots are not what your used to and have a unique look and feel. An average size 2.5cm each is a great way to get the attention of a passing hungry fish. Orders are made via there website https://spikebait.com the website is clean and the ordering process is simple. This was simple to navigate by simply selecting the shop table from the top menu. Once the order was made an email confirmation came through immediately after to confirm the order had been made with a receipt and order number for tracking. I received my maggots in the mail about 4 business days after making my order. This was the same time-frame for 4 other FishingMad testers who also placed an order. These maggots are produced out of Victoria so that seems reasonable. The order came in a standard postage bag. You will need to be careful of a few factors here. Firstly the tubs of maggots were delivered without any type of basic cooling system so you will need to keep an eye on the weather forecast and try not to place an order during very hot conditions. Secondly the tubs of maggots are not really padded so hopefully, they don’t get tossed around to mush during transit. That being said the maggots were delivered in perfect order, the tubs were filled in coco peat, which is there to sustain the moisture throughout delivery and future storage and ensures your Spikes won’t shrivel up and lose size. This is the real point of difference to other maggots I have seen on the market or maggots I have seen homegrown. They are obviously much large in size almost double the standard maggot size. The colour is also much darker tan to a standard maggot to the point of almost being brown. One thing I did note was the movement was much different. These maggots don’t move as much as a standard maggot which at first had me quite concerned. The maggots come in a plastic tub full of coco peat which is great. The best way to store the maggots is in a cool, dark place and Spikebait will remain in their big white state and be usable for 2-4 weeks. If they turn darker during this period this is a natural part of their life-cycle and they are still perfectly usable. I kept mine in the fridge but after reading their website found that this is not the recommended method. I have learned over the last few years that maggots are a very versatile bait that can be used on many different species. This would include bream, trout, redfin, carp, yellas, cod, estuary perch, flathead, juvenile snapper ( pinkies ), whiting, garfish, mullet, flathead, salmon and other species. The most effective way to rig I have found is to use a very small size 10, 12 or 14 mudeye hooks. You want to just pierce the maggot rather than having the hook go right through. The less damage you do to the maggot the more active it will be on the hook. Despite some of my concerns, these maggots have proven to be very effective. I have had 2 sessions to date with them. Session one was targeting bream at Williamstown of Ferguson street pier. It was a brief session cut short due to a Hyundai commercial being filmed in the immediate area, however, I caught 8 bream in 70 minutes. 1 x 37cm, 1 x 36.5cm, 1 x 34 cm and the rest under legal size. The first bream was caught in roughly 10 minutes then the bite was steady and frequent from that point. Berleying an isolated area help greatly to keep the bite going. A video of this session can be seen here. My second session was at a local river chasing carp. In a three hour session, we caught 8 carp the biggest measuring a respectable 64cm. We also lost several carp to snags so that tally could have been higher.